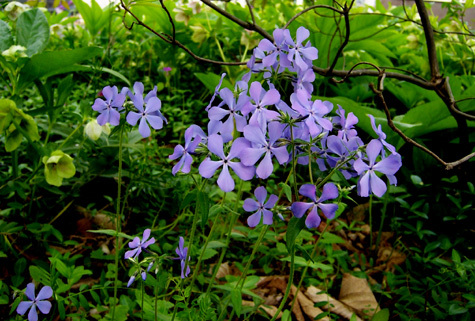 This clump of blue phlox was brought to my house from my father’s botanical garden in 1983. It is a lovely little woodland flower but struggles in my unkempt center city yard. ~ by Sandra Lynn Gray on April 12, 2008. Very pretty! I had forgotten how much further along toward summer you are there. I don’t know how to compare NC summers to Montana summers. I guess you know it gets dangerously mild here in the spring and everything blooms. Then we have an April frost and the fruit crops get killed. It reached 80 yesterday but promises to turn cold this weekend and maybe snow in the mountains. I am crossing my fingers that my blueberries don’t get zapped again this year. wow! Spring surely made a house call in your area! I’m glad of it – these flower shots are beautiful! It’s really difficult to call a favorite as they are all so pretty and are so full of life! !